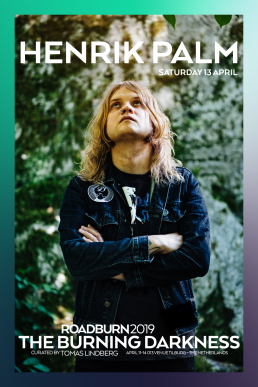 “With his first solo record Many Days he covers a lot of ground familiar to most Roadburn attendees, intertwining cronky, angular postcore riffs with kraut and shoegaze influences. I would say it is the natural meeting of everything I myself am looking for in a record. It is pretty, ugly, intense and challenging at the same time. “The record features guest vocals from among others Youth Code’s Sara Taylor, and is produced by Martin Ehrencrona, responsible for Watain and In Solitude and many more. “Henrik has cited bands as diverse as Celtic Frost, Throbbing Gristle, My Bloody Valentine and Final Conflict as influences, and it is all there on the record. When I finally got to see him live some time ago, the performance just blew me away. Be sure to not miss out on this. It’s a must see show. Henrik Palm will perform on Saturday, 13 April as part of Tomas Lindberg’s The Burning Darkness curated event.